Time here, doesn’t so much stop, as cease to be relevant. Under blue skies, the sun uses the mountains as a natural reflector. Pouring heat down that has the zinc roofs of the old houses contorting in agony. Ancient oaks, spread their branches. Relief, green filtered shade. Wine, alive. Laughing at the wilting lettuce, trying hard to be appealing. Old Potters Inn, on the Main Road, where horses meander happily. Noting the smart 4×4’s of the visitors amongst the somewhat road-worthy local vehicles. The swimming pool welcome at the end of a hot day. Our accommodation, comfortable and quaint. Purple gate in a hand packed stone wall, enticing. An alfresco meal, Tuscany family long table style, under the stars as the bells toll in the still evening. The wide open skies of the Overberg on the Southern Cape coast. A workers cottage, with its washing, amongst the barren wheat fields. The starkness of the Little Karoo around Robertson, transformed in springtime into a paradise of colour. Trees, dusted with the pink and red eucalyptus flowers. Yellow-orcha, stone filed earth, shimmering in the heat of summer. Farm dam, relief in which children play with the freedom of summer holidays. The summer menu at Clos Malverne intriguing. Litchi, wrapped in ostrich and stuffed with gorgonzola. Overshadowed by the simple salmon with avo that was sensational. Succulent venison, delicately supported by the cranberry jus. Dark chocolate creme brûlée (‘crime-brute’ in the auto spell, probably more accurate) with its summer berries, excellent. An abundance of pink and blue hydrangeas. Purple agapanthus and yellow day-lilies, between emerald lawns. The gardens of La Petite Dauphine in Franschhoek. Our surprise anniversary stop. Red chairs, emphatic beneath ancient oaks. No less attention seeking, than the red dress of a women walking through Grand Central station in the early morning. A French urn, artfully placed, a balance to mountain peaks. A courier truck loaded with cardboard boxes containing new canvases arrived at the studio. Larger ones than I have been using for awhile, which is a bother as the studio is full of the reneged covered furniture waiting to be moved up to Knysna. That, and the holiday wine stock doesn’t leave much room for paintings. Particularly wet ones! Survived the spa evening, which certainly worked out the travel kinks. The wind, impatient, full of enthusiastic holiday spirit. Knocking at windows, a ceaseless invitation. The joy of painting on a large canvas, my hands cramping from the extra work. The turquoise colour finding its home in the painting of Dwarsriver. A flash of Cézanne? The first of the spring Watsonia’s demanding a place in the painting. The pink flowers echoing the pink in the rock formation. The rain in the vineyards dissipated early enough for us to enjoy the gardens at Babylonstoren. A tortoise wondering along the pathway bounded by the plessage of layered quince tree branches. The precision of the gardens, amazing, even if its hard to get excited about vegetables, herbs and fruit. Looking to see if the last remaining poppy seed heads contained any late seeds, we met up with the garden curator, Gundula Deutschlander, who kindly invited me into her kingdom and seed store. Rows of carefully labeled seed jars, containers of drying seed pods and a bewildering array of vegetable seeds, that made me think of Joanne Harris’s book ‘Blackberry Wine’. I left with a magic packet of Shirley Poppy seeds, originally from her Mothers garden, for the garden at the cottage. Cosecha restaurant at Noble Hill offers a menu of Latin inspiration that has flavours bursting through your senses, with subtle undertones that provide a great platform to their wines. There is little artistry to the making of the guacamole, however, the taste makes this an item not to be missed. We were welcome to sit with Polly under the umbrellas overlooking the dam, and we didn’t get near the dessert section of the menu. Time to cut back some of the exuberant growth in the garden, sorting edges into something that my Virgo heart can live with, and hauling in pine needles for mulch and edging. The sun chasing me. Roger here from Switzerland, hand made chocolates from his children and days of enforced relaxation without a car, which he has taken to see Dad in Montagu. Hesta and Mark joined us for a scrumptious lunch under the trees, with the wine cellar conjuring bottles of liquid magic. On the easel in the studio, a canvas of circles against a pale background like some sort of abstract that lost its way in too much wine. Pincushion protea in the cottage garden the subject, the pale under painting to give life to the subtle colours of the protea. Great to be working in a larger canvas again, although my hands are cramping from all the work they are being asked to do. At the cottage, sitting gently on the patio enjoying the cool air and listening to the birds as they engage in their version of Hunger Games at the bird feeders. New Year’s Eve with lights coming on across the valley, bubbles and conversation, with laugher amongst friends seeing out the year. Cavalli, a new horse breeding estate that has a fabulous restaurant, gallery and wine from its own vineyards. 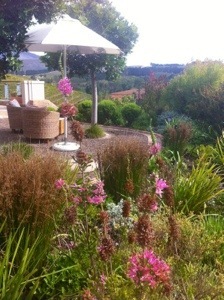 The gardens consist of miles of carefully planted indigenous fynbos, whose fragrance is rejuvenating. The modern buildings that look out over the Helderberg have environmental sustainability at their heart, sit gently in the landscape. Textures, light, elegant, harmonious are characteristics of the building that are echoed in the splendid food. The wines are accessible and we could have spent another zillion hours drinking wine, captivated by the view. That this is possible, while at the same time having access to the master works of the Cavalli collection in the gallery (No Rose-Innes, is a disappointment) and being challenged by a wide range of visual art seems unbelievable. Excellent in every way and bound to become a favourite. Tucked into the folds of the Langeberg mountains outside of Rooiberg, sits the Saggy Stone Restaurant and micro-brewery. It’s a busy spot for something that is 20km, much of it dirt, from the main road and the fierce sun no doubt contributed to the large volumes of beer being consumed, not lease by a party of gratefully hikers. Our food was generous and tasty, the service excellent and only the need to drive two hours back to vineyards stopped us from spending more time with Dad and Mary. The Da Vinci exhibition at the Chavonnes Battery Gallery was intriguing. The gallery space that has been built amongst the stone foundations of the original battery buildings is stunning. News coming out of South Sudan of the scale, and brutality of the violence, horrifying. Our humanitarian operations now the focus, and how to implement them with the staff safely relocated. Wind chimes stirred by the breeze, a special sound bringing memories of Christmas in Tazzie. Christmas lunch under the trees at the cottage. A menu of Terry’s pâté’, Stilton, tomatoes and salad bits, with Moët and 2011 Black Rock. Indulgent and scrumptious. We sat on the couch with Lesa and Alan watching the lights come on across the valley. Website updated, with the customary sprinkling of errors which seems to be an inevitable consequence of making a bunch of changes each time I’m home. Still haven’t found a way to do the updates remotely, particularly from South Sudan. Carpets spread under the pine trees, cushions and carpetbags. Dogs, people, wine, food and sunshine. The family day setting at the cottage. My cold (no malaria thank goodness) is driving me nuts! We wound our way through the pretty Elgin valley with its hidden blue lakes amongst the green mountains, across the pass to Franschhoek and our lunch spot at La Quartier Francais. The patio provided shade, the menu a host of intriguing options and the colourful yellow and green umbrellas, a cheeky cheerfulness against the blue skies. As one would expect of a Creation, there are lots of ideas. Some of which are stunning, some disappointing, some not worth repeating and when you thought you had it sussed, there is a surprise that leaves you with a smile. The art, molten glass and abstract relief emerging from the rough brick walls is elemental to Creation, and in keeping with the multi course food and wine pairing. Even if, like bathroom mosaics, none of it resonated with me. Disappointingly, and certainly not what one would expect from the creative process, there was no care taken to tease out preferences, and how the wide range of wines and food could best be adapted to cater to them. The formalistic approach did a disservice to the crafting of the wines and the skills of the chef. The view, dominated by the Babylon’s Toring Mountain range is special, without being exceptional. The restaurant, functional with stunning glass ware in which to enjoy the numerous wines, and the gardens a science in indigenous planting. The two bottles of Mount Babylon Pioneer Brut Reserve bubbles, made for own consumption, using 100% Shiraz, were an unexpected find. Creation, evolving into promise. As was the farewell greeting from the gardener, who should have received the tip.